Skatter Tech reported a few days ago that the Sony PlayStation 3 would have a built in hard drive. This information was partially false. Our source was a Business Week article, which claimed that the PS3 was loaded with some sort of hard drive. According to the PlayStation Global webpage the hard drive is suppose to be sold separately from the unit, which means it is either extenal or somehow goes into the unit. There is no word on this from SCEA yet, but if this is true we should expect that Sony will sell a bundle (aka. value pack) that includes a hard drive. “The PlayStation 3 will include BluRay, the high definition DVD technology, and support games in resolutions of up to 1080p, (the highest supported standard on the market. )!” This proves that the PS3 may actually live up to its expectations. Until SCEA makes their official press release no one will know about the true specs on the unit. 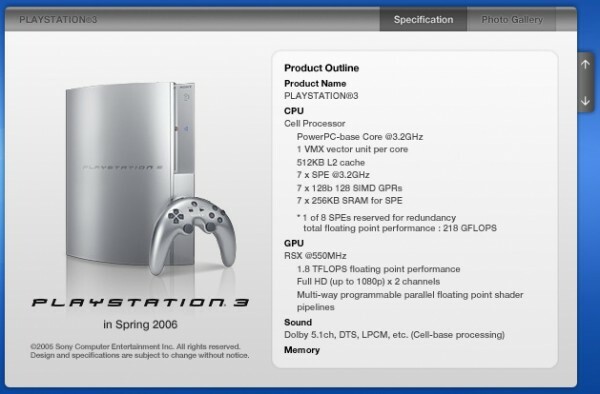 For now according to PlayStation Global the PS3 has a “Spring 06″ launch, a deatachable 2.5” HDD slot, support for Memory Stick Media, bluetooth controlers, and can display content in 1080p. Anyways that’s the update on the information that’s been found so far. We will inform you if any new information is leaked or announced. Previous Post: Will The PS3 Have a Hard Drive? computers beat consoles hands down! What are you talking about? Consoles are better for games…always! Its coming out with a 60GB Hard Drive and is coming out ometime early November. Wtf the new PS3 will be better then computers you just wait and see! I wish that I could afford one, I have a job but other expenses are sucking up all of my money. Nathan anyone can afford one. That is if you got the time to spend on it. Click on my name to go to a website that teaches you how to get game consoles under 10$. Kinda old post, but its a good one so I had to BUMP IT.